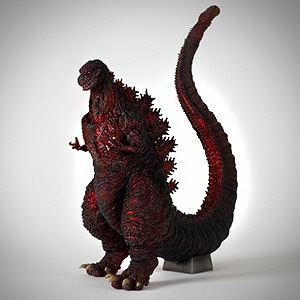 The Large Monster Series Pestar vinyl figure by X-Plus was released in early 2010. 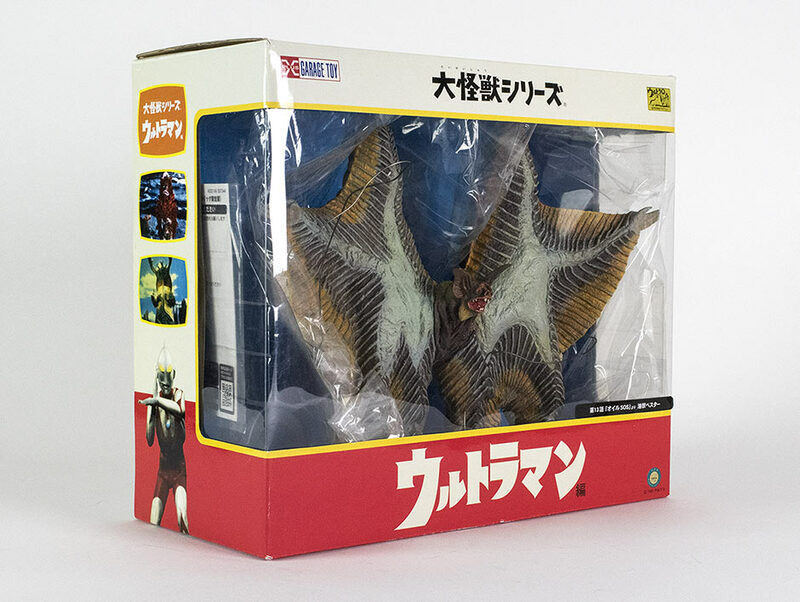 It was later reissued as a Wonder Festival exclusive soft version in July 2011. It’s based on the oil-eating menace, Pestar which was featured in episode 13 (titled Oil S.O.S. / オイルSOS) of the original Ultraman television series which first aired in 1966. This interesting monster was unique in that the suit required two actors to move it’s many “limbs”. 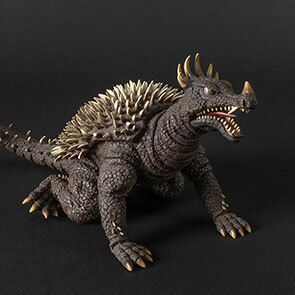 X-Plus has done an amazing job reproducing this kaiju in vinyl for the starry-eyed collector. The Large Monster Series Pestar comes packaged in a wider than usual window box but with the usual Ultraman box art. The design is a little retro and I just know that if my 8-year-old self ever got to see this box, I would probably burst with excitement. At least Big John gets to have one! The figure is saddled into a form-fitting plastic shell and tied securely in place with the same wires as other X-Plus releases. 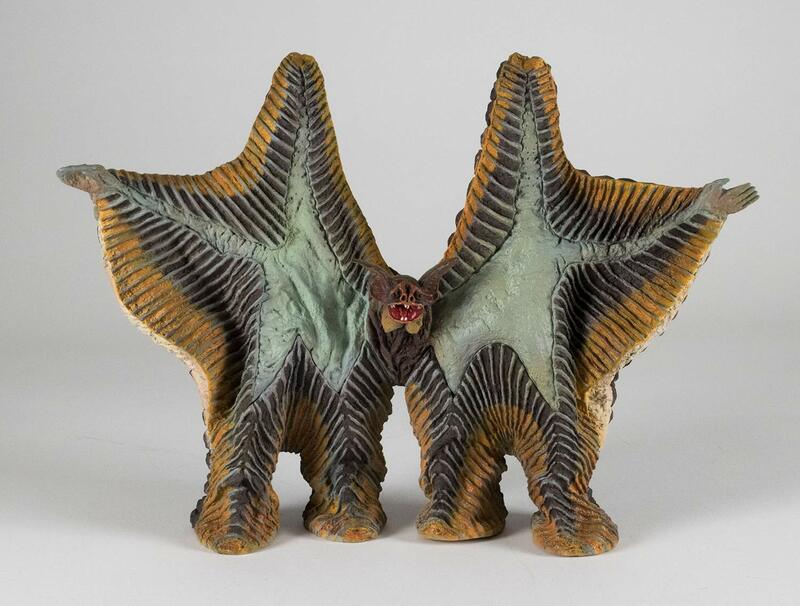 The Large Monster Series Pestar by X-Plus has an incredibly screen accurate sculpt which faithfully reproduces the giant oil-eating double-starfish from Ultraman’s very first year on screen. 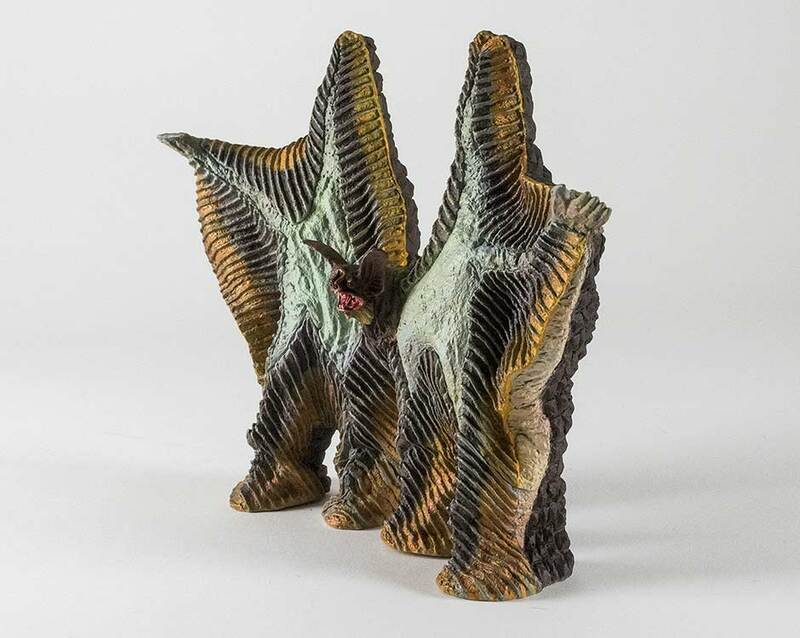 Even those unfamiliar with this kaiju can appreciate the level of detail in the sculpt depicting the radiating ridges reaching out from the monsters two stomachs. The tendency of this suit to fold and buckle is also captured very well. 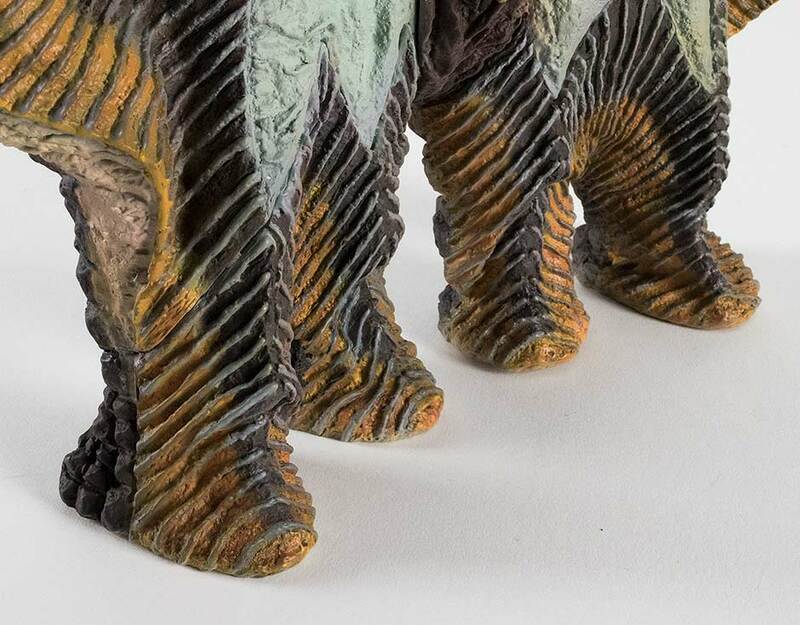 Together, these two details do well to separate this high-end collectible from mere toys. The tiny head sculpt, three-quarters of an inch wide and two inches from ear tip to ear tip is done remarkably well. When I look at it, I can almost see it move; quivering as it gulps up the barrels of oil from the episode. When that happens, you know they got it right! One thing which X-Plus did not do correctly is the appearance of the surface of both stomachs. Those are the light bluish-greenish patches in the center of each “star”. In the show, these areas were puffy and smooth; almost like inflated pool toys. 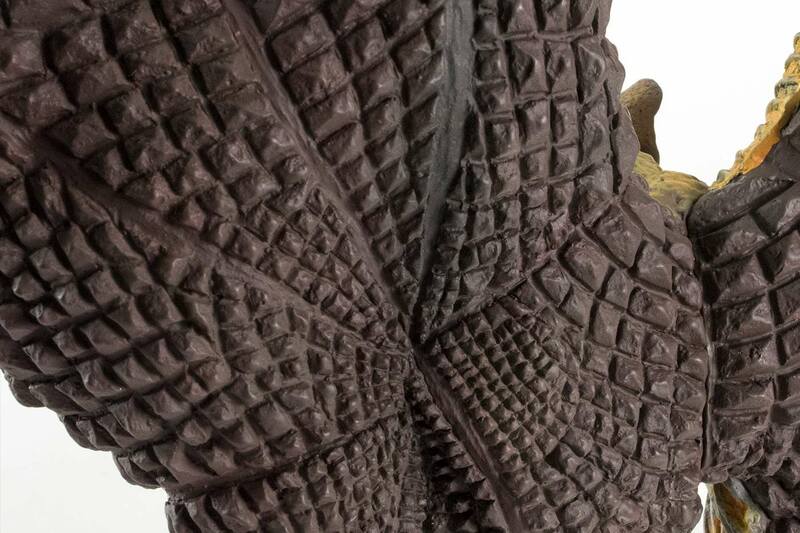 Yet the figure sports a dramatic, rocky texture far more dramatic than the actual suit had. I think this actually makes the figure look more impressive even though it does noticeably deviate from being screen accurate. And, check this out! The back texture is a marvel of detail. I actually never realized that Pestar’s back looked like this until I got my hands on this figure. While it may seem easy enough to sculpt by merely etching the patterned grooves, note that each shape is individually sculpted into a bevel. This must have been a laborious process for the one who sculpted it. Judging by how well it was done, it must have been a labor of love. The back texture is a marvel of detail. I actually never realized that Pestar’s back looked like this until I got my hands on this figure. X-Plus opted for a museum pose for this figure. It stands with both hands spread out to the sides as was frequently seen in the episode. But it was just as frequently seen bending forward and sideways, creating awkward buckles in the suit. While I’m sure X-Plus could have pulled it off a sculpt which realistically captured those buckles, I’m glad they went for this more standard — and grand — look. Holy hell, yes, there are seams all over this thing. Each pair of legs is a separate piece of vinyl. They join with the upper body pieces by zig-zagging along the bottom edge of each stomach. The neck is molding with the figure’s upper left side body, and finally the head is also a separate piece. Despite these five separate pieces being joined together, you will not notice them, or even see them without looking for them. The paint apps on the X-Plus Pestar are a collection of primarily three reserved and unsaturated colors. But here lies the second detour from accuracy. The outer edge of each “star” is colored with a dirty, mustardy hue. The suit actually sported a lighter, more vivid yellowish color in that area. But like the rough, textured surface of the stomachs not matching the suit, this color actually looks better on the shelf. Slits below the hands on both sides of the figure are painted a coral-like off-white with light mustard highlights drybrushed over top. You can get a look at these in the Footprint Section below. 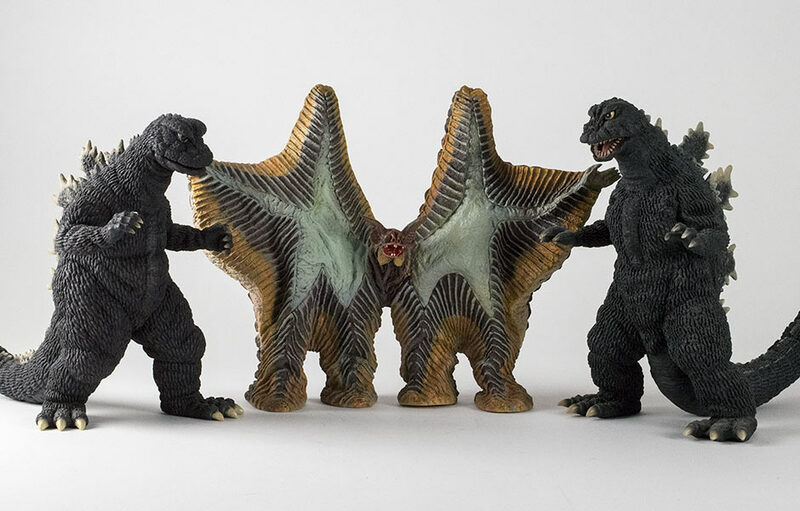 The Large Monster Series Pestar has a profile and footprint very similar to all of X-Plus’ Rodan figures. It’s very wide, demanding twice the side space of other figures. 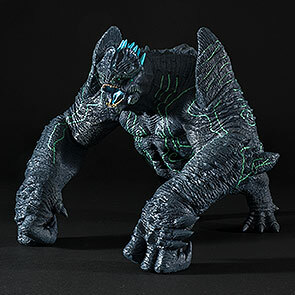 The Large Monster Series Pestar has a profile and footprint very similar to all of X-Plus’ Rodan figures. It’s very wide, demanding twice the side space of other figures. Yet, it’s pretty slim from the side view. This figure is barely 3 inches from nose to back. There’s no need to worry about space on the shelf though. This figure is well suited to standing at the back of the shelf behind other figures, blocking view of the back wall. It’s overly wide shape will actually add a welcome bit of variety to your Ultra shelf. 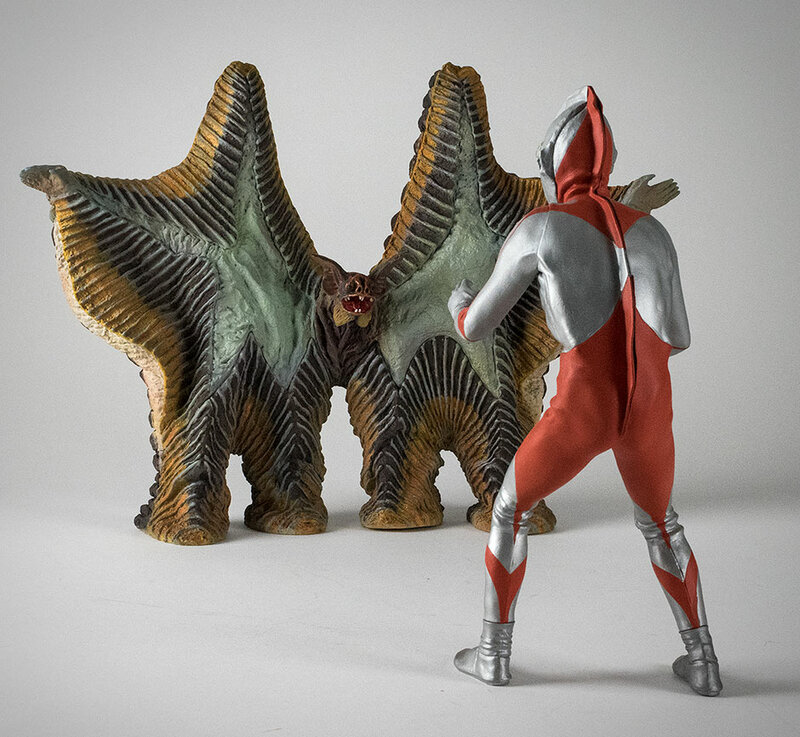 Here is a size comparison of the Large Monster Series Pestar and the Large Monster Series Ultraman A-Type Fighting Pose vinyl which came out came at the end of 2015. For an accurate pairing, you’ll need an A-Type Ultraman so that it matches the episode. As for the two being in scale, it’s hard to tell. In the episode, Pestar was already downed by a Science Patrol VTOL jet and only had one exchange with Ultraman, and that was while this monster was already flat on the ground. It’s probably safe to say that any Large Monster Series Ultraman figure will be a tad too large for a perfect fit. This is, unfortunately, how it is with the entire series. 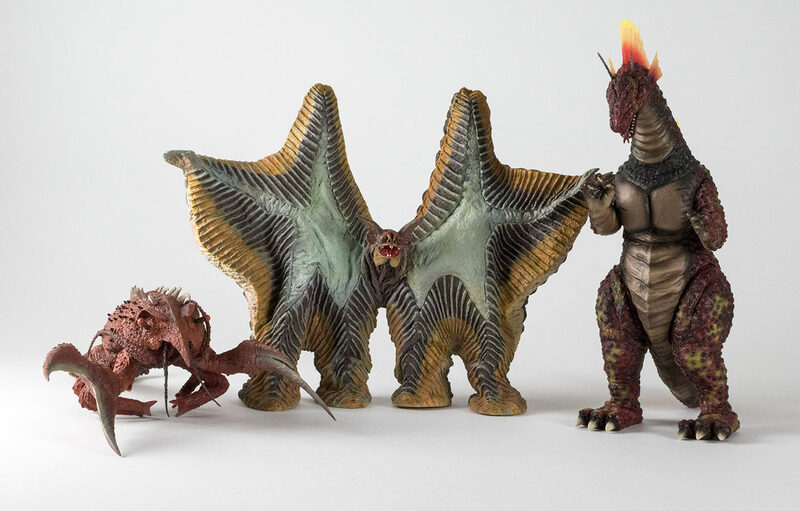 I’ve never understood why X-Plus made the Ultraman figures slightly larger than the Kaiju. 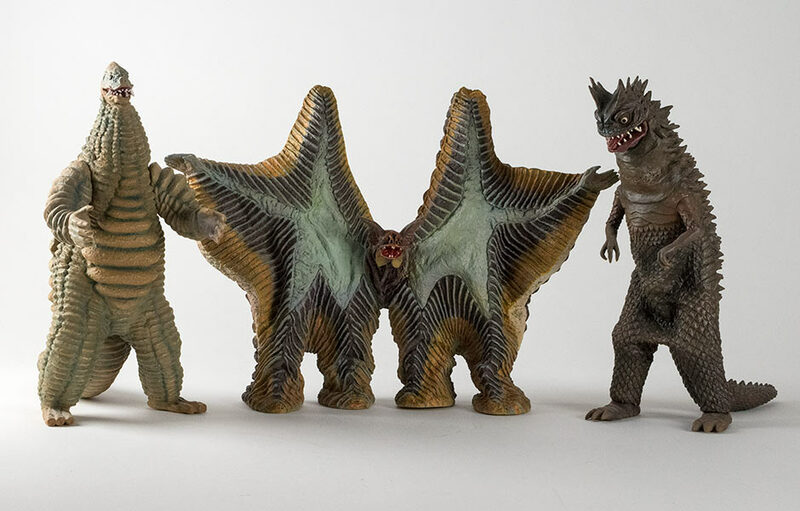 Here is a size comparison with other Ultraman Kaiju also from the original 1966-1967 series. 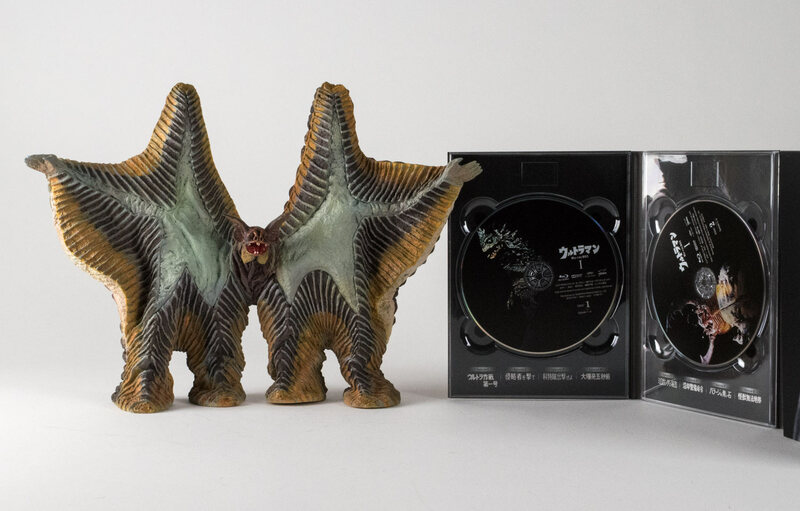 On the left is the Large Monster Series Gesura (which came out around Dec. 2015 – January 2016) and the Large Monster Series Gabora (I believe this may be the “Reborn” version). 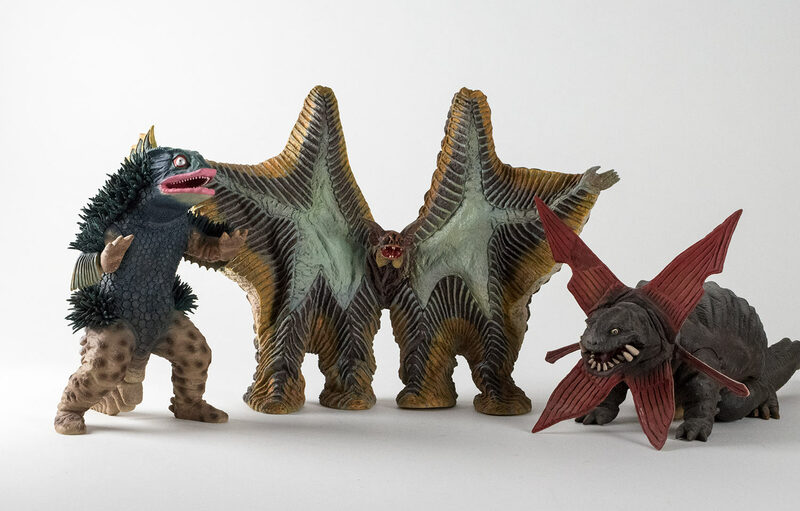 Pestar scales well with the Large Monster Series Red King Reborn Version (released in September 2011) and the original release of the Large Monster Series Bemular Reborn (from December 2010). 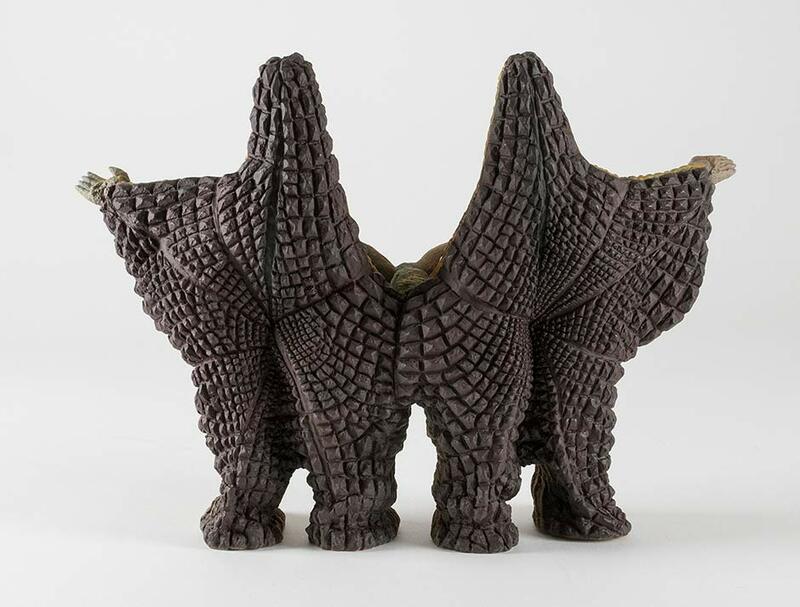 If you’ve no Ultra Kaiju, here’s a comparison with the Large Monster Series Godzilla 1968 and the Large Monster Series Godzilla 1966. 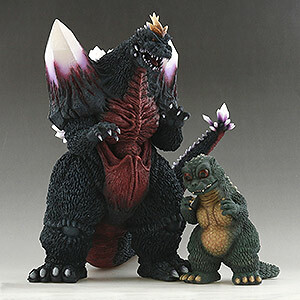 Finally a comparison with the Large Monster Series Ebirah and the Large Monster Series Titanosaurus. Here is a real world size comparison for those who have none of the figures above. Here, Pester stands beside the Ultraman bluray set. 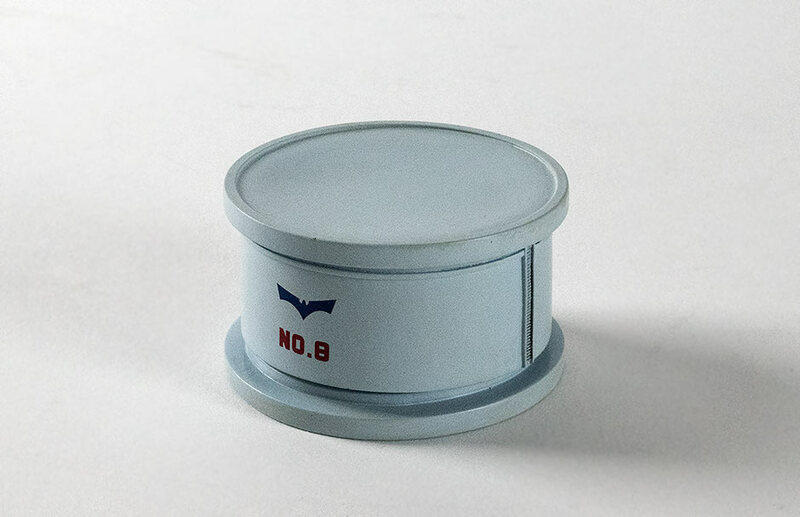 The Ric Boy Exclusive version comes with a mini oil tank form the oil refinery scene. Unlike extra pieces from most of the Large Monster Series Godzilla figures, this tank is pretty much in scale with the figure itself. And that is a HUGE plus in my book. While it looks like a simple piece, it manages to reproduce almost exactly how the tanks in the episode appeared. This tank in particular was specifically taken from the scene where Bemular shoots his fire beam at tank No. 8. 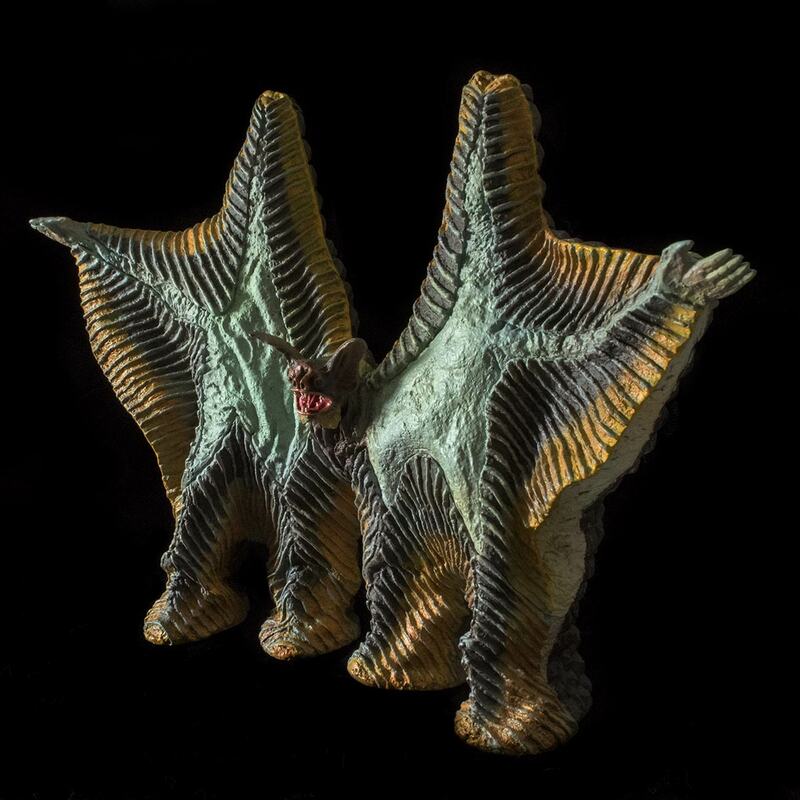 The Large Monster Series Pestar vinyl figure by X-Plus is an amazing replica of the giant double-starfish from the premiere season of the long-running series Ultraman. Despite liberties taken with one texture and one color, it shines, and is an amazing collectible and keepsake from the series. 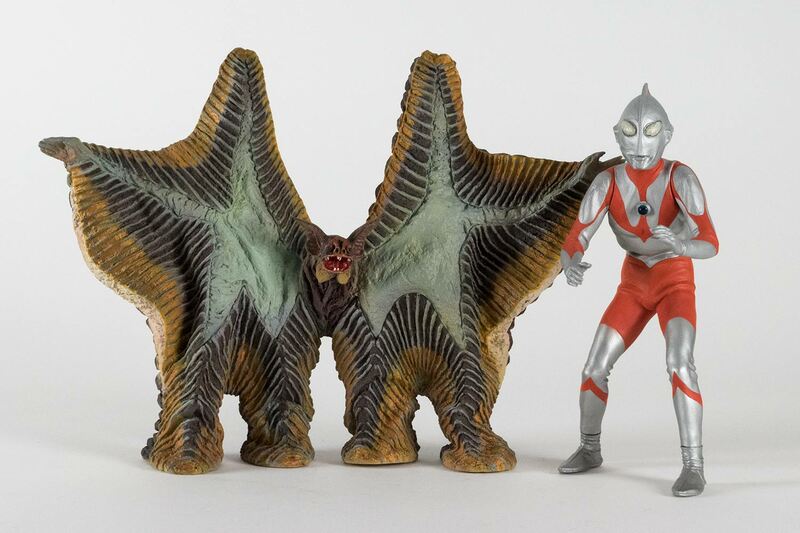 It will look amazing with the rest of your X-Plus Ultraman collection. • Archived Large Monster Series Pestar page on Ric Boy Site. 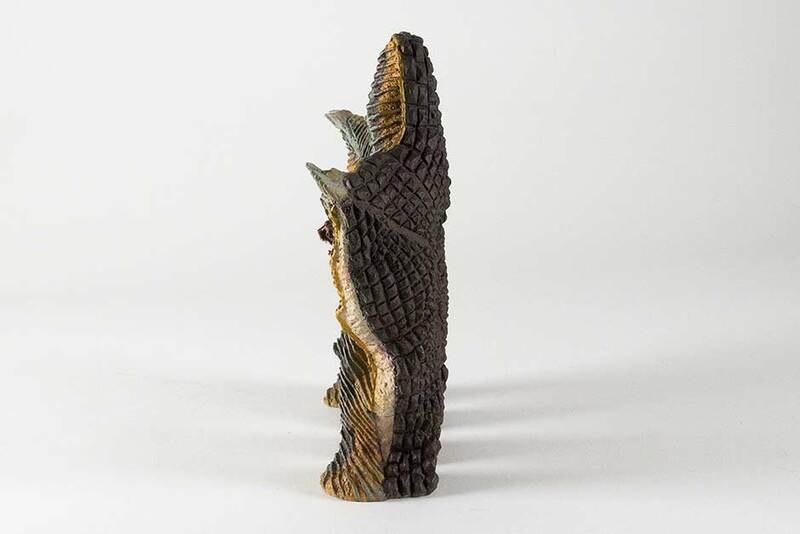 • Large Monster Series Ultraman C-Type Appearance Pose vinyl figure review. • Large Monster Series Alien Baltan (Reborn) vinyl figure review. • Giant Series Skydon vinyl figure review. 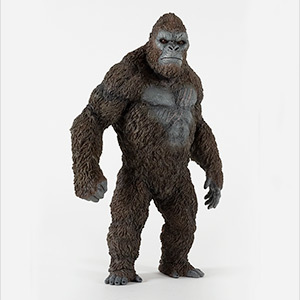 • Giant Series Gyango vinyl figure review. • Large Monster Series Ultraman Tiga vinyl figure review. 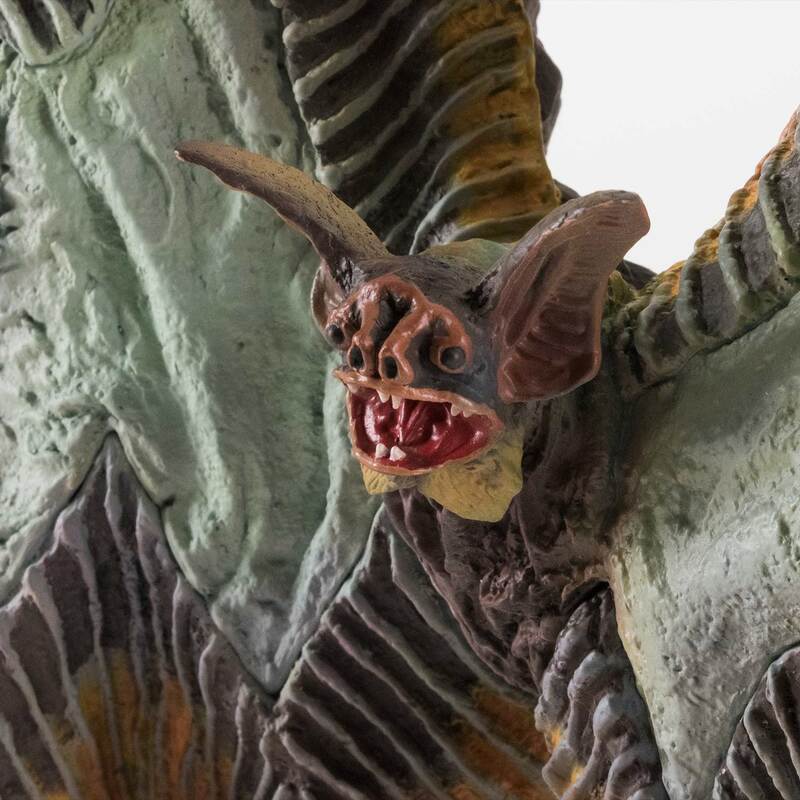 • Large Monster Series Gomora (Reborn) vinyl figure review. 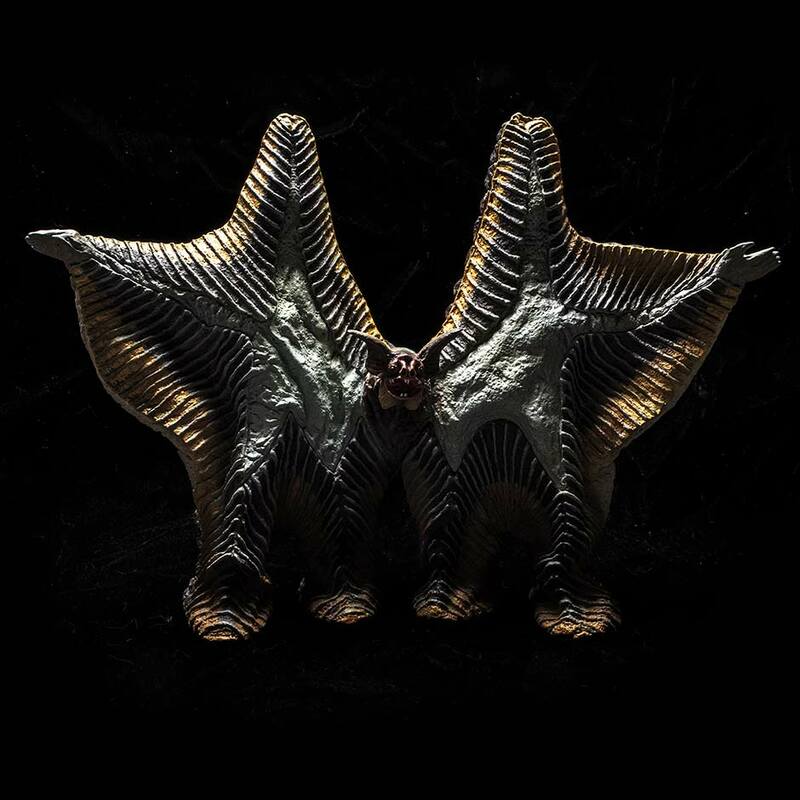 • Ultraman C-Type Spacium Pose vinyl figure review.